He was the son of Alexander J. Dallas (1759-1817), who had been secretary of the treasury (1814-16). A Democrat, Dallas held various local offices in Pennsylvania. 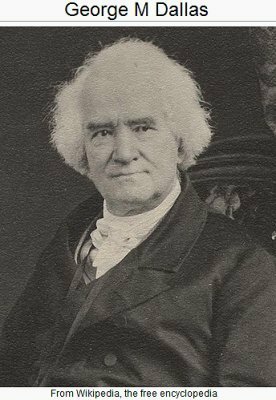 As vice-president he presided over the Senate debates on the Mexican War and the Wilmot Proviso. He secured an agreement clarifying Britain's role in Central America and a disavowal of Britain's traditional claim to the right of searching at sea the ships of other nations. Dallas contains more than 400 parks that cover a total of about 50,000 acres. The city of Dallas extends over a land area of 341.9 sq mi. The Dallas metropolitan area is made up of the counties of Collin, Dallas, Denton, Ellis, Henderson, Hunt, Kaufman, and Rockwall. City-owned greenbelts parallel White Rock Creek, Turtle Creek, and the Trinity River. In addition to Dallas, cities with more than 100,000 in population in the area are Garland, Irving, Mesquite, and Plano. 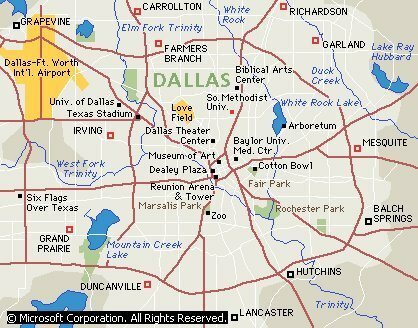 Dallas is also part of the Dallas/Fort Worth Consolidated Metropolitan Statistical Area, also known as the Metroplex. In addition to Dallas and Fort Worth, the Metroplex includes Arlington and more than 80 other towns and communities. The city of Dallas has sprawled into nearby counties, growing primarily to the north and west. The downtown is known for its distinctive contemporary architecture. Near the commercial center of the city is the West End Historic District, a group of 19th-century warehouses converted into shops and restaurants. 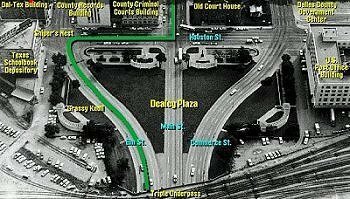 Also nearby is the Deep Ellum (Elm) area, which was a thriving center of businesses owned by black Americans from the time of the Civil War (1861-1865) until the 1930s. This neighborhood now contains clubs, restaurants, and galleries. Old Red County Courthouse The city's historic sites include Fair Park, the largest art deco art and architecture district in the world and a National Historic Landmark, located east of downtown; and Dealey Plaza, the site of the assassination in 1963 of President John F. Kennedy and a National Historic Landmark District, located downtown. 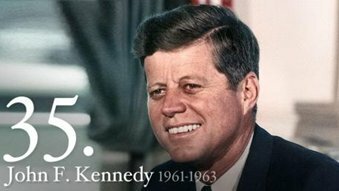 Other sites are the John F. Kennedy Memorial, designed by American architect Philip C. Johnson; the former county courthouse, designed in the Romanesque architectural style; the present courthouse and downtown library, designed by Chinese American architect I. M. Pei; the Sixth Floor of the former Texas School Book Depository, from which Lee Harvey Oswald allegedly shot Kennedy; and Old City Park, the site of Dallas's oldest public park and now a museum of the architectural and cultural history of the city and region. The Dallas area suffered an economic downturn in the 1980s, but it rebounded in the 1990s, posting the strongest employment growth in the state in 1994. The city has a diversified economic base. Service industries, including trade, make up the city's most important economic sector, followed by manufacturing. Dallas remains an important distribution, financial, and insurance center of the Southwest. 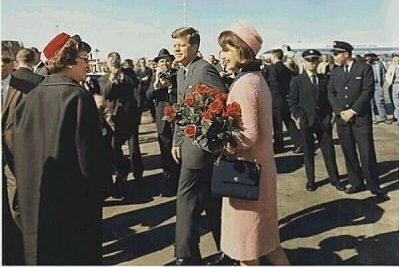 It is the site of a district Federal Reserve bank and the headquarters of a number of federal regional offices and large insurance and oil companies. Among the area's most important manufactures are technology-related products, including computers, biomedical products, and electronics. Dallas has the largest concentration of trade facilities in the South and Southwest. Its location in the north central part of the state and its dense network of railroads and highways enable it to serve as the shipping center for the agricultural and mineral products of the surrounding region, including cotton, cereals, livestock, fruit, petroleum, and natural gas. The passage of the North American Free Trade Agreement (NAFTA) in 1994 was expected to bring increased trade with Mexico. Scheduled air service is through two airports, including the Dallas-Fort Worth International Airport, which is one of the busiest in the United States. Dallas has long prided itself on being the center of culture in northern Texas. Dallas's population increased from 1980 to 1990 to over 1,000,000; by 1996 it had reached over 1,050,000. Institutions of higher learning in Dallas Texas. Dallas's council-manager form of government consists of a 14-person council elected from single districts for two-year terms, a mayor elected in citywide elections for a four-year term, and a manager hired by the council to administer the government. French traders had contact with the Anadarko people in the area around Dallas in the 1700s. In 1841 John Neely Bryan founded a trading post on the east bank of the Trinity River, near the junction of two Native American trails. Bryan was unaware that he had settled on land granted by the Texas republic to an immigration company, but he eventually legalized his claim. The extensive promotion efforts of the company brought settlers to the area, and in 1844 a townsite was laid out. The town was incorporated in 1856, and in the late 1850s, the collapse of a nearby cooperative community, La R�union, augmented the population and added skilled European craftspeople to the workforce. In March 1861 Texas seceded from the Union and joined the Confederate States of America. 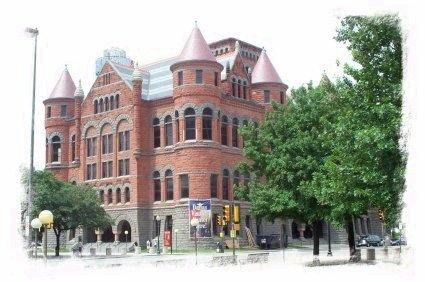 During the American Civil War (1861-1865), Dallas served as a supply and storage post for the state. 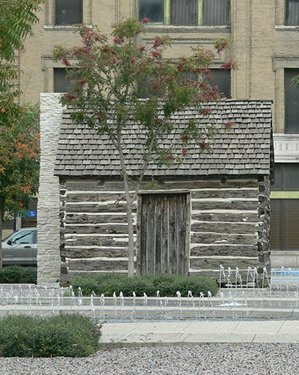 After the war ended, freed slaves flocked to Texas and founded a freedmen's town on the outskirts of Dallas. By 1870, the year Texas was readmitted to the Union, Dallas had a population of about 3000. Dallas grew steadily for the next 30 years. The successful lobbying for two railroads, the Houston and Texas Central in 1872 and the Texas and Pacific in 1873, initiated this growth. 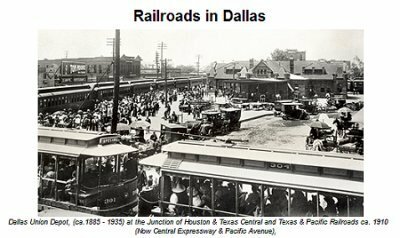 As a rail crossroads, Dallas became a regional transport center for products headed to Northern and Eastern manufacturing centers. Cotton became the principal source of income, but the city also attracted merchants and banking and insurance companies eager to exploit available transportation and communication facilities. Throughout this period, business and political leaders forged close ties, thus shaping the character of the city and guiding its economic direction. By 1890 Dallas had 38,067 residents and was the largest city in the state. The Panic of 1893, a national economic crisis, slowed the city's business development. Dallas recovered with the increase in agricultural prices in the early 20th century, and doubled its size with the annexation of Oak Cliff and other areas. In the century's second decade, Dallas began implementing an urban design plan created by George Kessler, a city engineer. The Kessler Plan connected Oak Cliff and Dallas, established greenbelts, and attempted to chart and direct urban growth. Control of the Trinity River also took a high priority. The city built levees and steel viaducts, and in a massive engineering project, the river channel was moved, straightened, and confined for flood control. The Great Depression of the 1930s had a severe impact on Dallas, but the crisis was partially alleviated by the discovery of the East Texas oil fields, which made Dallas a center of the petroleum business. Oil and the booming defense industry during World War II (1939-1945) stimulated growth and helped Dallas to diversify its economy. The city prospered economically with the rising oil prices of the 1970s and the resulting construction boom. The collapse of oil prices in the 1980s, the failure of many local savings and loan institutions, and the resulting collapse in real estate prices caused the city to tumble into an economic depression. Dallas civic leaders launched an economic program that included renovating part of the downtown area and attracting new industries. The city leadership also worked hard at smoothing racial tensions, which remained despite sizable growth in minority populations and improved sensitivity on the part of white leaders. Although Dallas was one of the last major cities to recover from Texas's mid-1980s economic collapse, the strength of its basic economy, its geographic location, and the recovery of the state economy ultimately combined to slow the economic decline in the Dallas region.